Please join us for a unique dining experience under the stars! We are teaming up with Wylder Space to bring you meal whose ingredients have been gathered from local sources, paired with lovely aged Fernwood wines, all enjoyed in an environment only Fernwood Cellars can provide you. Join us as we celebrate the end of summer while pouring our award winning wines at the 29th Annual Taste of Morgan Hill and Car Show. Enjoy the dozens of classic cars, arts & crafts, local food, and great music at this family friendly venue. LOBSTER BOIL PART DEUX ! We love to hear feedback from our members and friends. This summer we've consistently heard how much people enjoy our Lobster Boil event. So we decided to squeeze one more in and give everyone a chance to put back on your bib and crack open some Lobsters! In the chilly waters of Maine, lobstermen have been harvesting lobsters one at a time in wood-and-rope traps in much the same way for generations. Catching lobsters in traps is old-fashioned, yes, but then, creating Fine Wines in French, American and Hungarian oak barrels, rather than Stainless Steel and oak chips, may also be passe to some, but it is the ONLY way we know how to create Wines that echo “Quality is Timeless” over the generations. There are no short cuts to great wine and it is our commitment to you! 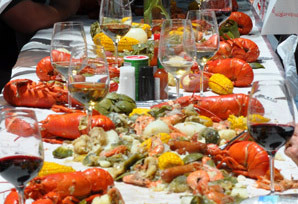 As a gift, you are welcome to take home a special Lobster Boil Riedel glass at the end of the event. Space is limited as we are keeping this intimate affair to 100 guests, so please reserve your spot now, as we welcome you along the banks of picturesque Little Arthur Creek! Our Fresh Maine Lobster, jumbo prawns, Andouille sausage, boiled with corn, garlic, Castroville artichokes, onion and potatoes are served with plenty of fresh sourdough baguettes and drawn butter. Book your overnight accommodations at Redwood Retreat! There’s no need to rush off following a Fernwood Cellar’s event. Lodging options are available! For information about The Estate Guest Suite click here or for other options call Linda and Kevin at 408-847-5186 to inquire. We are very excited to invite you to a one-of-a-kind dining experience! The "Reserve" version of our typical Dinner will take this event to new heights and exclusivity. Last year's event was commented on by one of the guests as, "One of the top 5 culinary events of my life!" A TUSCAN DAY IN THE GROVE AT REDWOOD RETREAT. COME JOIN US FOR A FUN FILLED DAY OF FOOD, WINE AND GAMES! We’ll be pouring our award winning wines at the highly-rated Los Altos Arts & Wine Festival. In addition to fine wine this festival showcases the distinctive works of artists and craftspeople from more than a dozen states, as well as a wide variety of foods including Thai, Chinese, Mexican, All-American favorites like sausages, hot links and roasted corn, sweets of all kinds, and more. Enjoy free concerts from performers such as Long Train Runnin’, The Houserockers, Blue House and Anna & the MRI. The Los Altos Arts & Wine Festival is a great event for the whole family with a large selection of rides, activities and entertainment for children all weekend in the Kidzone. Back by popular demand, we are featuring a Paella feed with popular caterers Hola Paella, featuring Executive Chef Fernando Craff! The entire evening will include great wines, company, and fabulous Spanish cuisine with appetizers and dessert, all set against the unique environment of our Creekside Redwood Grove. We will also be featuring the live music of The Michelle Pollace Latin Band Trio! In the art of entertaining, little can rival the aromatic, colorful presentation of Paëlla. Affection is exchanged as much in spoonfuls as it is in kind words, and this Spanish native has inspired many compliments. This feast strengthens friendships and compels conversation. Winemaker Matt Oetinger will be pairing exclusive wines with the entire meal that are not normally available to guests visiting the winery. The world famous Morgan Hill Mushroom Mardi Gras will be featuring Fernwood Cellar’s wines as a part of their exclusive premier wine tasting event. 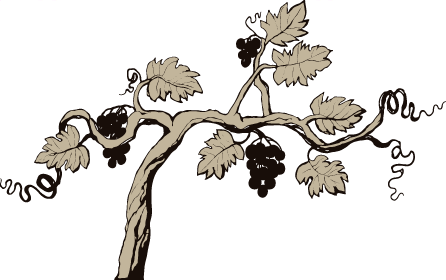 This event, for wine connoisseurs, will be held during the festival on Saturday, May 26 from 11am – 6:30pm and Sunday, May 27 from 11am – 5:30pm at the Morgan Hill Community & Cultural Center’s Rose Garden. For more information about the Morgan Hill Mushroom Mardi Gras please click here. Enjoy a wonderful and intimate afternoon with Great Wine, food, music & company in the Redwood Grove of FERNWOOD CELLARS. We created the Original Lobster Boil here 13 years ago and we make it better year after year! Offering you a unique way to Celebrate those you Love and the Finer things in Life! Join us at this wine and culinary extravaganza supporting the Morgan Hill Community Foundation. Fine wines, great food, and exquisite auction items will be available. Additionally, a special VIP tasting is available from 5 pm – 7 pm. For more information click here. Enjoy our award winning wines as you shop and dine at the 2018 Los Altos Mother's Day Wine Walk on the evening of May 11. This event will be held in downtown Los Altos. Join us in downtown Gilroy on April 7 as we pour our award winning wines at the 2018 Gilroy Art and Wine stroll. We’ll be joined by other local wineries as well as a number of local artisans. Click here for more information about this community event. Come spend a wonderful summers day out at Redwood Retreat dancing to your favorite songs and sipping on your favorite wines. The Peelers are the San Francisco Bay Area's riveting cover band sensation, recognized for elevating the live band experience to exciting new levels by creating unique non-stop DJ-like mash-ups and medleys of the latest hits on the radio with your favorite classics from all genres. Join us for a night of Wine & Beer tasting at Fernwood Cellars to help support our local Christopher High School Soccer team. A portion of each ticket and wine sales will go to the advancement of the soccer program. As the sole fundraiser and supporter for the 2018 CHS Girls Soccer program we are asking for support from local families and businesses. Your tax-deductable participation & support helps fund uniforms, equipment and video software to help assist in the college recruitment of these players. Please help us reach our goals and make this a major score for our girls! Thanks for your support. GO COUGARS! Enjoy a wonderful and intimate afternoon with Great Wine, food, music & company in the Redwood Grove of FERNWOOD CELLARS. We created the Original Lobster Boil here 12 years ago and we make it better year after year! Offering you a unique way to Celebrate those you Love and the Finer things in Life! Dinner in the Grove with Parsley, Sage, Rosemary & Time - Paella Feed! Our Last Dinner of the Season! Fernwood Cellars is excited to announce the grand opening of our exclusive wedding & event venue "REDWOOD RETREAT"
We would like to invite you to a unique culinary event and experience at the winery. Inspired by my trip to Madrid, Spain last summer with my son Jake, we've decided to bring some of that amazing culinary experience to the vineyard! Our first Dinner in the Vineyard of the year, as we enter into Spring will be a fabulous Spanish-themed menu prepared by Jeff Raby from Fire for Hire, utilizing recipes we brought back with us. We would like to cordially invite you to a special wine maker dinner. We have partnered with one of the finest restaurants in the Bay Area - Le Papillon. Executive Chef Scott Cooper credits reading, experimenting and, above all, travel for the development of his style of cooking. Wine Club Members Only - Winemaker Dinner. 5 Courses paired with Fernwood Cellars wine. A unique farm to table dinning experience limited to 40 members/guests. Dance, Drink & Eat - It's a party! We are excited to announce that we are bringing music back to the newly renovated Redwood Retreat grove. Sugadaddy is a fantastic band that has played many private events at the winery and for our family. We could not ask for a better band to bid Harvest goodbye. Bring your dancing shoes! Come experience what’s become one of the favorite and most talked about unique winery events. The Oetinger Oktoberfest is back and going to be better than ever! Our last Dinner in the Vineyard of the Year. Surf & Turf themed menu. Please join us for a unique culinary experience with great friends, wine and music.